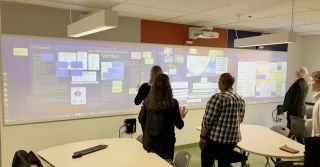 Dawson College in Montreal, Quebec, recently completed the largest installation to date of Nureva’s visual collaboration systems in a single classroom. An active learning classroom at the school includes eight Nureva Walls that offer a total of 56 feet of digital workspace. The goal of the technology is to enhance active learning by providing students with tools for collaboration and expanded interactive space where they can create, visualize, and manipulate learning objects while building knowledge together. The new classroom has one triple Nureva Wall that creates a 21-foot-wide digital space, two dual 14-foot systems, and a single 7-foot system, along with cloud-based Span software. The result is an immersive experience that enables student groups to view, interact with, and share large amounts of information at the digital wall or from their smartphones, laptops, or tablets. Dawson College has 10,000 students and 600 faculty members and is part of Quebec’s unique Collège d'enseignement général et professionnels (CEGEP) network, which includes colleges that provide a bridge between high school and university levels. While the installation of eight Nureva systems is novel, it’s a natural evolution of the college’s commitment to put powerful interactive learning tools into the hands of students. The college already had two high-tech active-learning classrooms with seven interactive whiteboards for student groups to use for collaboration. The addition of the Nureva classroom brings new capabilities and enriched interactivity to group work, elevating the learning experience for students.